How to make agility competitions fun again? Do you ever feel frustrated, sad, or even angry at the end of a competition day? Perhaps you feel this way while driving to the trial site, or even while filling out the entry form, or walking the course? How do these feelings affect your ability to focus at trials? Let OneMind Dogs Coach Megan Foster help you balance your mind on trial days! 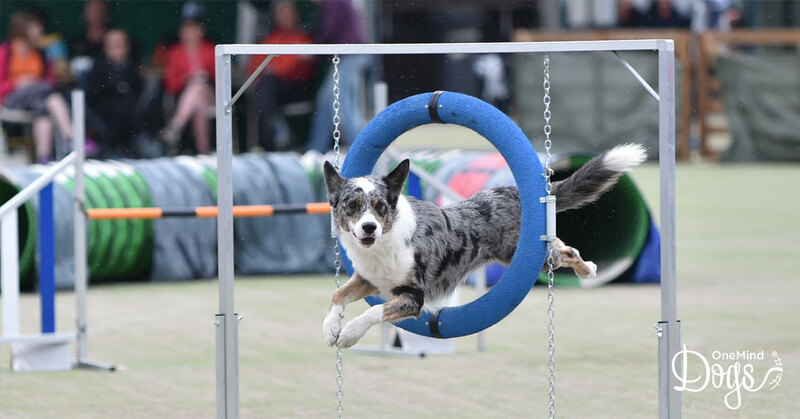 There was a time in my agility career when agility competitions were no fun, and I would be unhappy with any number of things throughout the day: the schedule, the course, the surface, and ultimately my results, which were impacted by my frustrations with things outside of my control. Mindset training has played a pivotal role in my training, competing, and coaching others. The tools I have been practicing for the last four years have given me the ability to calm my mind and focus on the tasks in front of me in agility and in everyday life. The three most important skills that have helped me are inner speech, using my mistakes to coach me, and focusing on the things I can control. Why am I sharing my story with you? 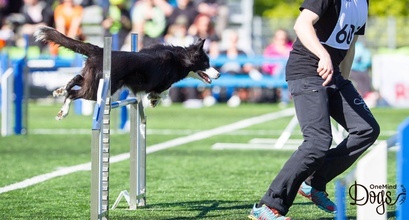 I believe that mindset training within agility handlers and competitors needs to be more normalized, and talking about it can only encourage others to give it a try! Back to those important skills. I had to manually stop my own thoughts and challenge my own beliefs about myself, my dog, the training, the competition. It was heavy lifting for my brain, but with practice, it is now easy for me to find evidence to support positive feelings and defray negative ones. Before working on my competitive mindset, I would focus too much on how I didn’t know how to do something, or let a mistake replay in my head on repeat for hours or even days following a competition. Now, I use those mistakes to push me. When looking at courses, I commit to trying a strategy that I feel is the best for my team and if a technical error occurs, I go home and train it until I understand how to do it better the next time I see that situation on course. It was important for me to create boundaries for myself around my energy, my thoughts, and my actions. I had to learn to protect myself from distractions. Distractions like local gossip, dogs barking, even a friend sharing their workweek drama with me. It was important for me to learn that to do my best in competitions, I could only use up so much brain power for other people or things that I have no influence over. Join me in helping all competitors take the first step on their mindset training journey! Share your story! If you are already studying Mental Tools, tell your story to a friend. Your journey may inspire others to start their mindset training! Encourage others! If you feel like finding positives about your own runs is difficult, try looking for positives in others’ runs! It’s the same skill, you just have to practice it and generalize that behavior back to yourself! Bonus, you’ll make someone’s day brighter by sharing that compliment with them! Focus on the conversations you keep during training or competitions. It is all too easy to fall into a storm of complaining, future telling, and thoughts of certain doom. It sounds a little silly when I write it like that, but part of my mental training was to become aware of my habits and determine which habits were serving me. Learn all the mental tools Megan mentioned and more! Sign up to Leading OneMind Dogs Coach Janita Leinonen’s and Mental Coach Anne Talvitie’s praised Mental Training: Tools for Life online course! Early-birds get a discount until December 24th!